Inside the pink brick estate he built with a blues fortune, 72- year-old Claud Johnson cannot shake the habits he formed when he was a poor man. Three years after moving in, he still has more rooms than he has furniture. Creamy wall-to-wall stretches across the second floor, which is mostly empty. To tell the truth, he's not sure if his wife, Miss Ernestine, has ever gone up there. He keeps his finicky 25-year-old Mack gravel truck parked nearby, where he can keep an eye on it through the living room window. He drove the truck, by his own estimate, one and a quarter million miles. Even as plants poke up around its chassis, it seems the truck — not the blues or the house — is the thing that matters to him. After Claud won his court battle in 1998 and was recognized as the son of blues music legend Robert Johnson, his lawyer handed him a six-figure cashier's check and begged him to quit hauling gravel. Claud kept hauling gravel for five months. "After 29 years, it just gets in your blood," said Claud, whose smile reveals glinting gold dental work. "I wake up some mornings, I want to get on that truck." Late in life, surrounded by the wealth of a stranger, Claud has begun to consider a parent he never knew. Robert Johnson was a blues guitarist, singer and songwriter. Disgusted with fieldwork, he left his sharecropping family around 1930 and took to the highway, re-cording, in his unearthly voice, 29 songs. Johnson's music was so good, other men said, that his talent could not be natural: Delta leg-end has it that one day at a back-country crossroad, Johnson waited for the devil to come by. After that, Johnson could play any song he wanted, but he had surrendered his soul. Johnson was just 27 when he died in August 1938 — poisoned, most people believe, by a jealous husband in a Greenwood, Miss., juke joint. He was so poor and unloved, it is said, that his body was dumped into the ground without a coffin, and to this day, no one is entirely sure where he's buried. But the brooding songs he wrote and recorded have been discovered and rediscovered by the generations that came after him. People in Greenwood have become accustomed to the Japanese tourists who come looking for Johnson's grave. Just this year, Rock and Roll Hall of Famer Eric Clapton released "Me and Mr. Johnson," a CD devoted entirely to Johnson's blues. In the midst of all this celebrity is Claud Johnson, who did not know until he was almost 40 that his father had recorded mu-sic. Claud is that rare thing, said blues historian Gayle Dean Wardlow: an ordinary man who was drawn into a legend. "He's just a little old country boy from Crystal Springs, Miss.," said Wardlow. "It's almost like, I guess, one of those Shakespearean things. He got pulled into it, totally." Since 1974, Robert Johnson's songbook had been in the hands of a California record producer and blues archivist, Stephen LaVere, who sought out the musician's half-sister, Carrie Thompson, and promised to split the profits evenly. Over the next decade, that bargain dissolved into a catfight. LaVere was pressuring bands like Led Zeppelin and the Rolling Stones to pay to use the music. Thompson, meanwhile, had turned against LaVere, and attempted to sever the contract. Then, in 1990, Sony put out a boxed set of Johnson's music, expecting it to appeal to a narrow audience of blues connoisseurs. It won a Grammy and sold more than 500,000 copies. When word got out that Robert Johnson's estate could be worth millions, putative heirs appeared by the dozen. Willis Brumfield, the estate's executor, began getting calls at odd hours from people who claimed they were Johnson's long-lost twin brother or daughter, he said. "They had some idea it was a fortune of money," Brumfield said, "and it was." Out of this cacophony emerged Claud Johnson. A few people already knew who he was. In 1970, a Texas cultural historian named Mack McCormick had traveled to Crystal Springs to search for Robert Johnson's relatives, and found himself face to face with a twinkly old woman, who, he recalls, "just burbled over. She said, 'My boy is his baby.' "Blues buffs passed the information among themselves — a son! But Claud continued with his quiet life. The estate eventually grew to $1.3 million. But Robert Johnson's executors found that they had no clearly established heir. Thompson, the half-sister, had died in 1983, and her half-sister and son were still wrangling with LaVere over the licensing rights. LaVere recalled mentioning Claud to the executors. Not long after that, Claud received a summons in the heir-ship case. "I didn't know what to do with the letter," Claud said. He decided to hire a lawyer. When Claud retained the services of Jim Kitchens, a prominent Jackson trial lawyer and former district attorney, they were already friends of 30 years' standing, from the days when Claud dropped off deliveries for Kitchens' family store in Crystal Springs. Kitchens bought barbecue at Claud's pit, and Miss Ernestine treated him, Kitchens said, "like one of her own kids." In Kitchens' office, an over-head fan revolves lazily and a picture of Elvis Presley is propped against an upright piano. "I said, 'Sure I do,' " Kitchens recalled. "He said, 'That was my daddy." "He said, 'Well, there's my momma. Among the dirt farms of southern Mississippi, where Claud was raised, there were two kinds of people: those who listened to the blues and those who did not. Claud knew early in life that he was the second kind. Born out of wedlock to 17-year-old Virgie Mae Smith, he was mostly raised by Virgie Mae's father, a preacher and sharecropper, in a house where music was slapped back like the creeping fingertips of the devil. If the blues came on the radio, a hand flew to the radio and switched it off. Once, Claud's uncle bought him a guitar, but his grandfather told him to put it down immediately. His grandparents told him his father was Robert Johnson, a blues singer. Robert Johnson had given Virgie Mae a small amount of money after learning of Claud's birth — $20 or $30 —but showed little interest in the boy after that. Around his fifth birthday, Claud watched from the doorway of his grandparents' house as they talked to a grown man in a light-colored shirt and black pants. "They stood on the porch. They made him stand in the yard," he said. "They talked to him a few minutes and then he went away." Pulled out of school every year to work in the fields, Claud dropped out for good in the sixth grade and found satisfaction in work, long hours of it, sometimes at two or three jobs. He sold barbecue from a pit beside his house, worked at gas stations and a car dealership; his wife waited tables at a local diner. Claud saved enough to buy his own gravel truck — a ma-chine so crotchety that he carried a tangle of cables and four extra batteries in order to start it, Kitchens remembers. Often Claud drove it for 18 hours a day. In this way, he and Ernestine put five children through college. His grandparents' stern influence had served him as a rudder, steadying him throughout his life, he said. "It learned me something about life, growing up that way," he said. 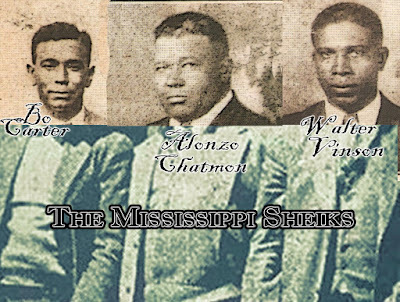 Then, in his 60s, the heirship case opened a view into a second Mississippi: a place where, in moments of glamour, young people ducked the narrow rules of sharecropping life. In testimony, Claud's 79-year-old mother and her friends would describe the dark clubs where the field workers gathered, laughing, in the half-light of evening. 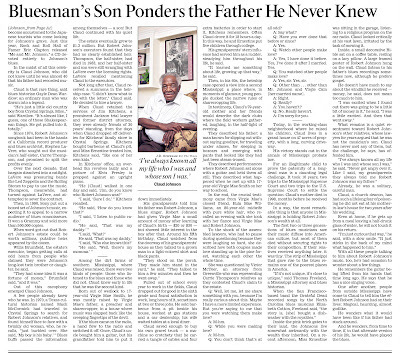 They described his father: a man known for slipping out with-out saying goodbye, for traveling under aliases, for sleeping in boxcars and emerging with pants that looked like they had just been steam-ironed. They described performances where Robert Johnson sat alone with a guitar and held them all still. They described what happened when he met up with 17-year-old Virgie Mae Smith on her way to school. In the end, the crucial testimony came from Virgie Mae's closest friend, Eula Mae Williams, an 80-year-old midwife with pure white hair, who recalled an evening walk she took with her fiance and Virgie Mae and Robert Johnson. To the shock of the assembled lawyers, who had to pause during questioning because they were laughing so hard, she de-scribed how both couples made love standing up in the pine for-est, watching each other the whole time. She was questioned by Victor McTeer, an attorney from Greenville who was representing Carrie Thompson's relatives as they contested Claud's claim to the estate. Q: Well, let me, let me share something with you, because I'm really curious about this. Maybe I have a more limited experience. But you're saying to me that you were watching them make love? Q: While you were making love? Q: You don't think that's at all odd? Q: Have you ever done that before or since? Q: Watch other people make love? A: Yes, I have done it before. Yes, I've done it after I married. Yes. Q: You watched other people make love? Q: Other than…other than Mr. Johnson and Virgie Cain [her married name]. A: I'm sorry for you. Today, in the working-class neighborhood where he raised his children, Claud lives in a grand house on 47 acres of property, with a long, curving drive-way. His victory stands out in the annals of Mississippi probate law. For an illegitimate child to prove the paternity of a long-dead man is a daunting legal challenge. It took 10 years, two trips to the Mississippi Supreme Court and two trips to the U.S. Supreme Court to settle the question. Claud's mother died in 1998, months before he received the money. In a way, the most remark-able thing is that anyone in Mississippi is holding Robert John-son's wealth at all. The first two or three generations of blues musicians saw their music diffuse into American culture, but most of them died without securing rights to their composition. If their relatives received anything later, it was tiny. The strip of Mississippi that gave rise to the blues re-mains one of the poorest places in America. "If it's not unique, it's close to unique," said Thomas Freeland, a Mississippi attorney and blues historian. When the San Francisco-based band the Grateful Dead recorded songs by the North Carolina blues musician Elizabeth Cotten, Freeland said, "the story is, [she] bought a dish-washer with the royalties." Inside the pink brick gates to their land, the Johnsons live somewhat awkwardly with the wealth they inherited. On a re-cent afternoon, Miss Ernestine was sitting in the garage, listening to a religious program on the car radio. Claud looked critically at his vast lawn, irritated by the task of mowing it. Inside, a small decorative Bible sat on a coffee table, resting on a lacy pillow. A large framed poster of Robert Johnson hung on the wall. Claud listens to his father's blues recordings some-times now, although he prefers gospel. He doesn't have much to say about the windfall he received —money, he said, does not mean too much to him. "I was excited when I found out there was going to be a little bit of money in it," he said. "I was a little excited. And then that went away." What remains is a quiet resentment toward Robert John-son's other relatives, whose lawyers for years argued that he was not the musician's son. Claud has never met any of them, but the challenge, he says, has of-fended him. 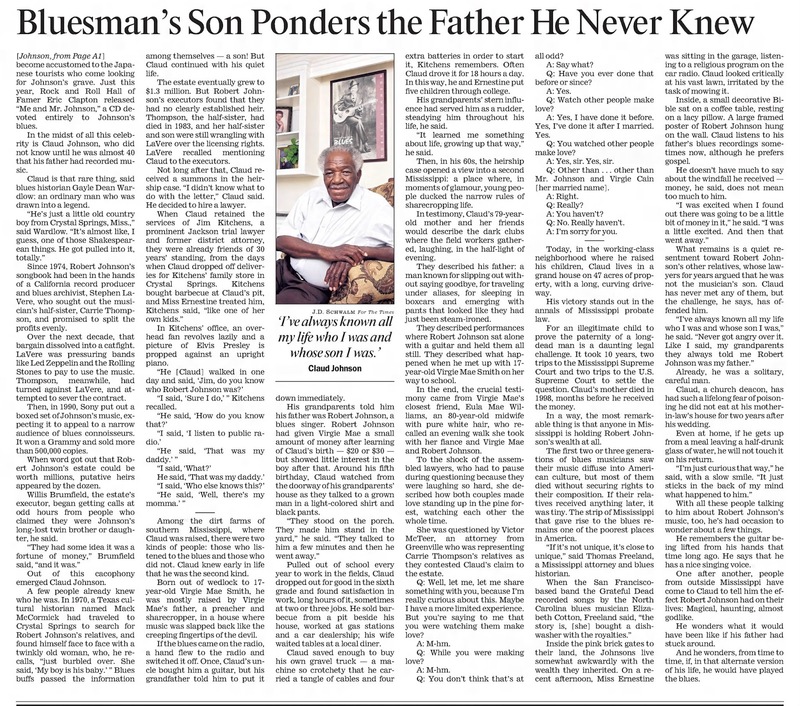 "I've always known all my life who I was and whose son I was," he said. "Never got angry over it. Like I said, my grandparents they always told me Robert Johnson was my father." Already, he was a solitary, careful man. Claud, a church deacon, has had such a lifelong fear of poisoning he did not eat at his mother-in-law's house for two years after his wedding. Even at home, if he gets up from a meal leaving a half-drunk glass of water, he will not touch it on his return. "I'm just curious that way," he said, with a slow smile. "It just sticks in the back of my mind what happened to him." With all these people talking to him about Robert Johnson's music, too, he's had occasion to wonder about a few things. He remembers the guitar being lifted from his hands that time long ago. He says that he has a nice singing voice. One after another, people from outside Mississippi have come to Claud to tell him the effect Robert Johnson had on their lives: Magical, haunting, almost godlike. He wonders what it would have been like if his father had stuck around. And he wonders, from time to time, if, in that alternate version of his life, he would have played the blues.